A move to the cloud can help your team scale faster, innovate, and also provide users continuous delivery. And taking a cloud first, security first approach allows you to work tight knit security features and controls into cloud initiatives from the ground up - including AWS security. Sure the thought of putting sensitive company data in a public cloud can be scary - #crazyscary! Kind of like online dating. But the good news is that it doesn't have to be scary or expensive! 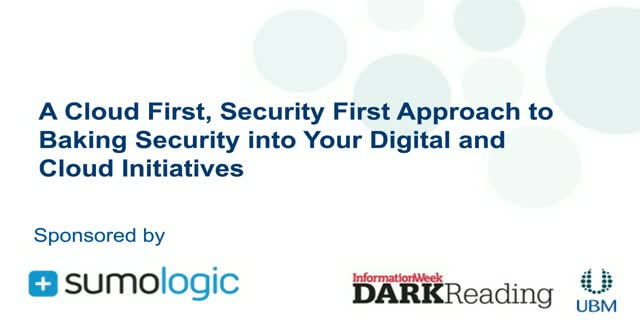 Enterprises are running their workloads across complex, hybrid infrastructures, and need solutions that provide full-stack, 360-degree visibility to support rapid time to identify and resolve security threats. Trend Micro Deep Security offers seamless integration with Sumo Logic’s data analytics service to enable rich analysis, visualizations and reporting of critical security and system data. This enables an actionable, single view across all elements in an environment. Show a live demo showing how to integrate Deep Security with Sumo Logic Platform in three easy steps. Legacy monitoring and troubleshooting tools can limit visibility and control over your infrastructure and applications. Organizations must find monitoring and troubleshooting tools that can scale with the volume, variety and velocity of data generated by today’s complex applications in order to keep pace with business demands. In this webinar we discuss how Sumo Logic helped Scripps Networks harness cloud-native machine data analytics to improve application quality and reliability on AWS. Sumo Logic allows IT operations teams to visualize and monitor workloads in real-time, identify issues and expedite root-cause analysis across the AWS environment. Continuous innovation and speed to market are mandating dynamic paradigm shifts in how companies conceive, develop and implement IT operations and security strategies. Digital enterprises are migrating mission-critical workloads to the cloud and leveraging advanced AWS infrastructure to reap the benefits of agile development and competitive advantage. However, a lack of real-time visibility inhibits robust and consistent “cloud-first” security strategy… and keeps business executives awake at night. It comes as no surprise that today’s applications are more complex than ever before. Teams are migrating or architecting their modern applications in the Cloud, and many of these application are leveraging NoSQL databases like MongoDB to power the applications. With the rapid adoption of Agile and DevOps practices, application changes are now measured in release cycles of hours or days. What is all the buzz around containers and Docker? This new technology definitely is the solution to all the ills of distributed computing. After all, the combination of instant startup and reliable execution makes Docker containers ideal for delivering and running successful apps at scale. However, Docker introduces new challenges that require new ways of management. The deployment complexities and security concerns in Docker environments challenge even the most advanced IT teams. How many Docker containers are currently running? When have these containers been created or stopped? What are the key operational container metrics (CPU, memory, network usage)? What are the containers consuming most resources? Logs and metrics go together like peanut butter and jelly. The combination is essential for proving incredible insights into the performance and health of your application and infrastructure. However, you need peanut butter and jelly in the same sandwich to get that great taste, and analyzing log and metrics with multiple solutions doesn’t work either. You get frustrating swivel chair management, inefficient troubleshooting, the high costs of multiple tools, limited DevOps collaboration, etc. To address these challenges, leading companies have adopted Sumo Logic’s Unified Logs and Metrics (ULM), the industry’s first machine data analytics platform to natively collect and analyze metrics and log data together in real-time. With Unified Logs and Metrics, teams no longer need to juggle between multiple tools to monitor their modern applications or troubleshoot when things go wrong. With all their machine data in one place, teams are finding that they can troubleshoot issues much more quickly and efficiently. Agile development, speed, application-uptime, modern apps – the list of needs and wants from teams supported by security goes on and on. To help enable these teams meet these challenges quickly and efficiently, the cloud seems like the perfect fit. Yet, the thought of moving to the cloud makes some people a little uncomfortable – kind of like online dating. This is where we come in! We’ve brought together two security industry experts and a leading security professional to talk about the pros and cons of moving to the cloud. Robert Mahowald Group Vice President IDC, Christian Beedgen CTO & Founder Sumo Logic, Inc.
Have you ever found yourself wanting to build something new and innovative, but struggling with where to start or how to overcome the obstacles? Is your company trying to push towards cloud-native architecture and you’re unsure of how to begin that journey? More often than not teams see great tools but aren’t sure how the developers of those tools got there. Enter stage left our two modern technology experts. Robert Mahowald, Group VP at IDC, brings to the table more than 20 years of technology expertise and has a track record of understanding trends and “the next big thing.” Christian Beedgen, founder and CTO of Sumo Logic, is a technology veteran who has spent his career building innovative applications that are able to scale leveraging the latest tools available. We’ve pulled their brain power into a single webinar to dive into the ins and outs of building cloud-native. Ben Newton, Principal Product Manager Sumo Logic, Inc.
You know the feeling – it’s 4:00AM, your app is down, and you’re on the hook to fix it. The last thing your tired eyes need are multiple tools to sift through for insights to get you answers. Wouldn’t it be great if you could have all your machine data – your logs and metrics – correlated in a single tool? We all know the world is changing – as businesses make the move to the digital world, software is now the primary source of innovation and engine for business growth. This increasing rate of innovation comes with a laser focus on agility on modern applications to drive the business. It’s clear today’s app ain’t your daddy’s app. Teams have become cross-functional and collaborative, but the tools available for monitoring and troubleshooting apps simply can’t keep up – and that’s where we come in. Sumo Logic recently announced the industry’s first cloud-native machine data analytics platform powered by machine learning technology, that can natively ingest and analyze both structured metrics data and unstructured log data together in real-time. What does this mean? Now, you can have instant access to the full analytics breadth for modern applications – from code to end-user behaviors to move with the speed and agility necessary to compete in today’s digital business world. In this informative discussion Matt Heusser will walk through a day in the life of a software tester and share common practices that have led to failed release cycles. Next, Michael Floyd, Sumo Logic’s Head of Developer Programs will show how Github statistics can be used to gauge the health of your release process, provide indicators of team productivity, and understand the impact of process change. The advantages of versioning automated checks with your code. How Docker Images can be used for testing. How to anticipate the potential risk/volatility of a release. "It is inevitable. If you haven’t already it won’t be long until you are part of a project to migrate to the cloud. For many that means moving some or all of your data to AWS. Sounds easy but many a migration as gone south quickly for a variety of reasons. Moving and living in the cloud is a different animal. Designing and living in a cloud footprint is going to require a different way of doing things, from process, to tools to policy, change is inevitable. So how do you adapt and save valuable time and money by avoiding the idiot tax? In this premiere webinar Alan Shimel, editor-in-chief of DevOps.com will be joined by Pauly Comtois of Hearst Corporation who has led several successful cloud migrations. Pauly will provide us the pro tips you need for a successful migration. What common pitfalls to avoid, how to avoid them and what tools will you need to update when moving from on prem to the cloud. Save yourself the aggravation and learn from someone who has been there and done it. For instance, your logging tool of choice on premises may not fit the bill for the cloud. What about Cloud security? Management? Compliance? All issues that Comtois has had to face at Hearst. Pauly will share his 6 most important pro tips on AWS migration and discuss other things to be mindful of as well as answer your questions. Watch this webinar to hear from our experts on their best tips for organizations who are preparing and planning for an AWS migration or are in the midst of one." How do you secure your data and user information when it is in the cloud? As more organizations move critical workloads to AWS, security of that data becomes incredibly important, forcing organizations to consider what steps they take to ensure that data is secure at all times. For many, the answer comes through security analytics. The end goal is to monitor your servers and traffic to understand who is accessing you site, how they are doing so, and if they are getting access to your data and user information. This means monitoring incoming traffic and system logs to determine if and how attackers are approaching your application. Having a robust security analytics solution becomes key – without the proper tool, this crucial data can become noise and disguise key anomalies within the data that indicate a security problem. Listen in on this webinar in which Sumo Logic and Peter Varhol, industry expert, go over key best practices on how to protect your AWS applications from attackers and dive into how your organization can begin to leverage the power of security analytics and machine data to better secure your data in the cloud. In this webinar, we will discuss how to monitor your applications in the cloud, how to determine what data is important, and how to respond to a potential attack using the power of security analytics. DevOps teams are challenged with monitoring, tracking and troubleshooting issues in a context where continuous integration servers and DevOps tools emit their own logging data. This challenge is especially apparent for developers who are building applications in Docker. Machine data can come from numerous sources, and CD tools may not agree on a common method. Once log data has been acquired, assembling meaningful real-time metrics such as the condition of your host environment, the number of running containers, CPU usage, memory consumption and network performance can be challenging. View this on-demand webinar to hear from our experts on the importance of log data in providing full-stack visibility for developers building applications using Docker containers. This webinar will also detail how a solution like Sumo Logic’s cloud-native log management solution can provide real-time visibility that will be critical during the development process. Payment card fraud is big business for organized groups of hackers around the world, and the costs of data breaches continue to rise for consumers, banks, and businesses. That’s why organizations of any size that process, store, or transmit payment card data are required to comply with the Payment Card Industry Data Security Standard (PCI DSS), which aim to prevent such sensitive information from falling into the wrong hands. Failing to achieve PCI Compliance is not only damaging from a compliance perspective, but can also be damning from a brand and customer base perspective. For organizations striving to achieve or maintain PCI compliance, meeting each of the individual requirements can be difficult and overwhelming. Among the more challenging PCI requirements for many organizations is Requirement 10. This requirement mandates that organizations centralize, review and retain their network and application log files and then protect those logs so they cannot be deleted or modified. Complying with Requirement 10 can be quite a burden for many IT organizations because of the volume, variety and velocity of data that are part of the modern IT infrastructure that powers many digital initiatives. Organizations looking to meet PCI compliance requirements must find a solution that can easily aggregate their data in a secure manner and provide the ability for users to easily pull insights and metrics from this body of data. Is your team ready for continuous code delivery? In today’s “there’s an app for that” environment, business units demand new and competitive features as quickly as they can think of them. However, even though the adjectives used to describe DevOps – release, speed, automation – are all about moving forward, doing so without an idea of where you’ve been or where you’re heading leads to unsustainable development operations. For more information, visit https://www.sumologic.com . If keeping your applications running is keeping you up at night, you need to do more than just hope your machines keep running. Simple monitoring might have been good enough when your applications weren’t difference-makers for your business, but today IT is not only a partner, but also a driver of the business. When it comes to modern applications, machine data becomes crucial for IT organizations to troubleshoot and monitor in real-time. Just copy and paste the link below into your browser's address bar. Sumo Logic - The landscape of security is changing. While information security teams have always been one of the largest producers and consumers of data, the need for robust tools to understand that data is more urgent than ever. Event and activity logs have grown to big data proportions and the diversity of data being consumed has become significantly more varied. As the need for continuous security intelligence and accelerated incident response increases, traditional log and event management tools and monitoring practices are becoming increasingly insufficient. More teams are coming to realize that their traditional SIEM just isn’t going to cut it, and are shifting their focus towards advanced security analytics. Sumo Logic is a secure, cloud-native, machine data analytics service, delivering real-time, continuous intelligence from structured, semi-structured and unstructured data across the entire application lifecycle and stack. More than 1,000 customers around the globe rely on Sumo Logic for the analytics and insights to build, run and secure their modern applications and cloud infrastructures. With Sumo Logic, customers gain a multi-tenant, service-model advantage to accelerate their shift to continuous innovation, increasing competitive advantage, business value and growth. Founded in 2010, Sumo Logic is a privately held company based in Redwood City, CA and is backed by Accel Partners, DFJ, Greylock Partners, IVP, Sequoia Capital and Sutter Hill Ventures.